For a long time Chile has not been an uncharted territory in electronic music, if we just think of Cristian Vogel, Dinky, Matias Aguayo and others, most of them having found a creative home outside the native country. But it’s not quiet in Santiago de Chile either: Ojo de Opolo is a local label specialised on deep and minimal house. After mid-2000’s, when the definition “minimal” almost became a pejorative, this particular might seem very outdated, but current EP tries to prove the opposite. 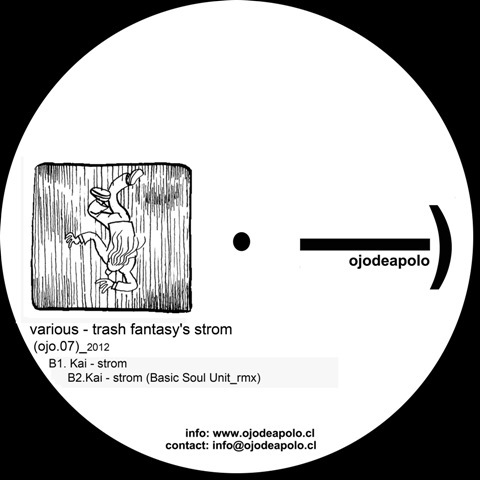 The release is opened by Jorge Cortés AKA Jorge C. with a long and easy-going minimal house cut “Trash Fantasy”, which plays with cinematic samples and varied tempo. Chicago Skyway remix features a deeper groove and combines snares and hi-hats in mid-1990’s Relief style. On the B-side Japanese producer Kai continues in a more slower house note, although the track title “Storm” might promise something fierce. For the conclusion the release is taken to new heights by Basic Soul Unit, spicing up the “Storm” with ample bass and fat acid house grooves, especially check the second half. To sum it up, many common elements of house music have been distilled “Trash Fantasy’s Storm”, but as a neatly produced release it deserves attention, also because of its 32 minutes that make it by length a mini-album.